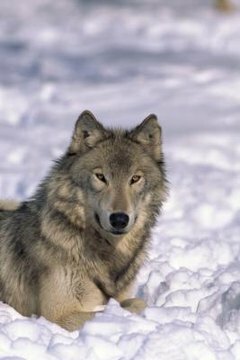 The wolf (Canis lupus) is a dynamic breed of wild animal and a close biological relative to the domestic canine. Estimates vary about the life span of a wolf. The experts at the Animal Planet website say life expectancy is about 10 to 18 years; "National Geographic" magazine, however, says the figure is closer to 6 to 8 years for a wolf living in the wild. The grey wolf and the near-extinct red wolf are the two wolf breeds in North America. Wolves travel and reside in packs of five to 15 members. A wolf will mate for life, and pups will stay with their parents until about 2 years of age. The wolf has been commonly viewed as vicious, although it rarely attacks humans. It does, however, prey on domestic pets, which makes it vulnerable to hunting and trapping efforts. Wolves in the wild die much sooner on average than wolves in captivity. PBS reports that mortality rates for pups is 60 percent. One of the primary causes of natural death is starvation. Fights with large animals and with other wolves can lead to mortal injuries. Disease is also a possibility, and this risk is made greater by the encroachment of humans onto wolf habitat.